All senior staff and room leaders are qualified Nursery Nurses with a certificate in First Aid and either a National Nursery Examination Board Certificate (NNEB), B-Tec National Diploma, NVQ level 3 in Childcare, Early Years Educator (EYE) or DCE Level 3 in Childcare and education. They will usually have received two years professional training with practical experience in nursery and primary school, the home, day nursery, hospital and special care centres. The Nursery Assistants are also dedicated and are sensitive to the needs of the individual children. Assistants have a range of experience, some possessing other qualifications, most are in training for the Level 2 Diploma or the Level 3 Diploma (EYE). Staff are encouraged to participate in courses and further their professional development. We require all staff to attend Emergency Paediatric First Aid Training and Child Protection Training. The nursery operates a key person system. A key person has special responsibilities for working with a small number of children, giving them the reassurance to feel safe and cared for and building relationships with their parents. Staff photographs are displayed in each room help identify the team.  Staff wear red polo tops with the Goldilocks embraided on. There is also a display board in the main entrance hall of all the staff that are employed by Goldilocks day nursery. These ratios allow for adequate care even during staff’s lunch breaks, sickness periods and short holidays.